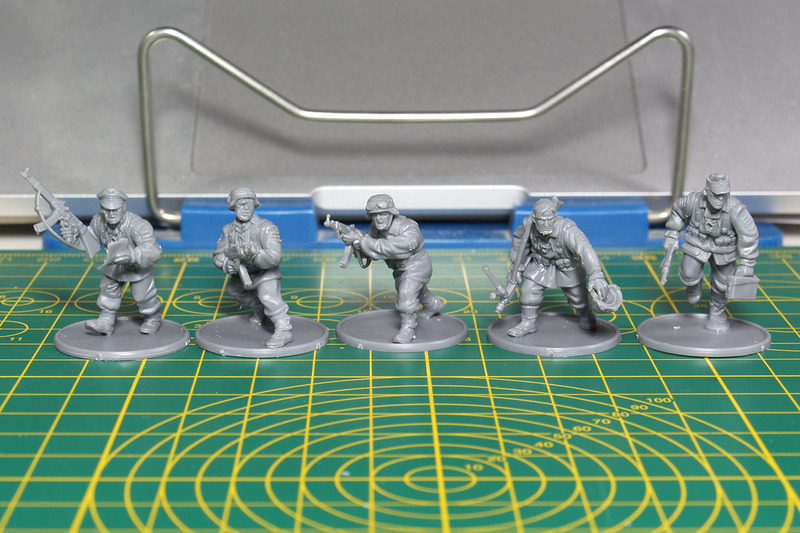 Closing the themed week on Operation Market Garden with one of the antagonists. 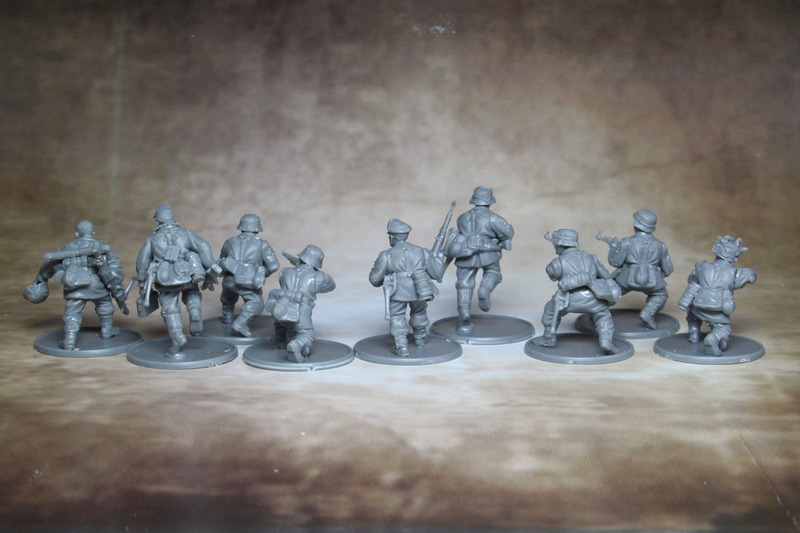 Fighting against the Allied Airborne units were dominantly units of the Waffen-SS. 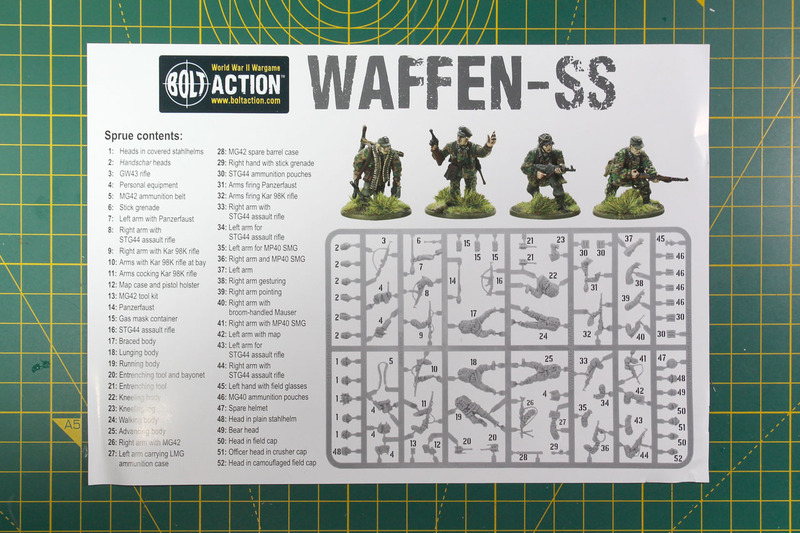 Warlord Games released a plastic kit of the armed wing of the Schutzstaffel this summer and we're covering it in a review. 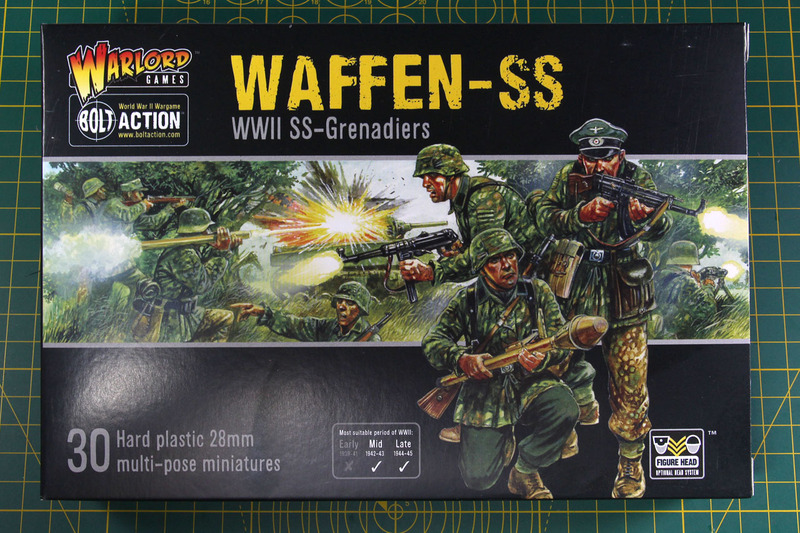 This review is not meant to glorify any political ideas or (military) activities of the Waffen-SS and is purely meant to cover the quality of the plastic kit and its miniatures. The former armed guards of the Nazi party grew from three regiments to 38 divisions over the war. 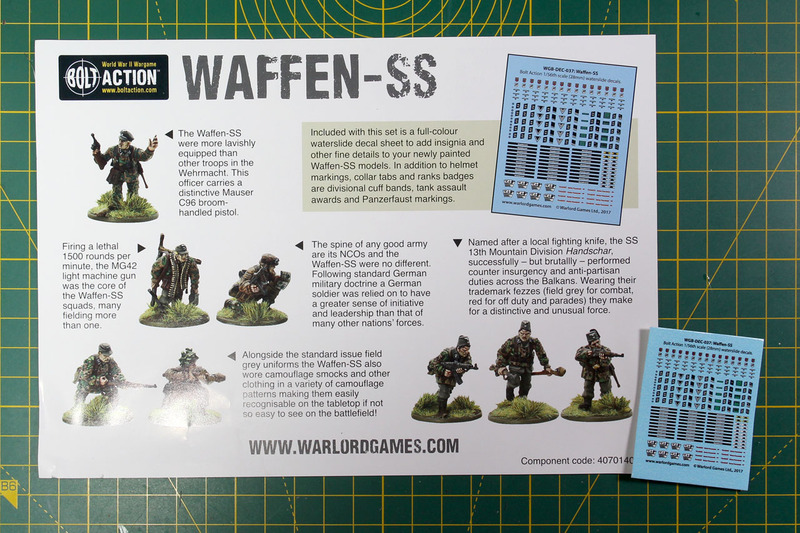 Seen by many as the elite, veteran infantry of the German forces, the Waffen-SS is a controversial topic. They fought fiercely and zealous, indoctrinated and well equipped by the party, but not to forget committed many atrocities and war crimes. Units of the Waffen-SS weren't just drafted within Germany, but there were many volunteer divisions in (occupied) countries like in the Netherlands with the 23rd SS Volunteer Panzer Grenadier Division Nederland. These volunteer divisions could be as large as 80.000 men (Latvia) or just 54 (British Free Corps). 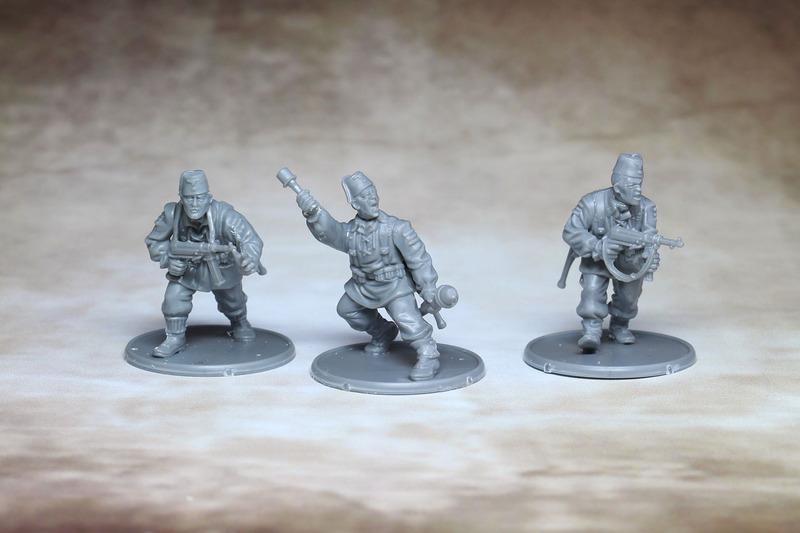 With this kit you can build regular Waffen-SS units as well as the Handschar, the first non-Germanic Waffen-SS division, who marked the expansion of the Waffen-SS into a multi-ethnic military force, by using the M43 fez instead of the helmets. 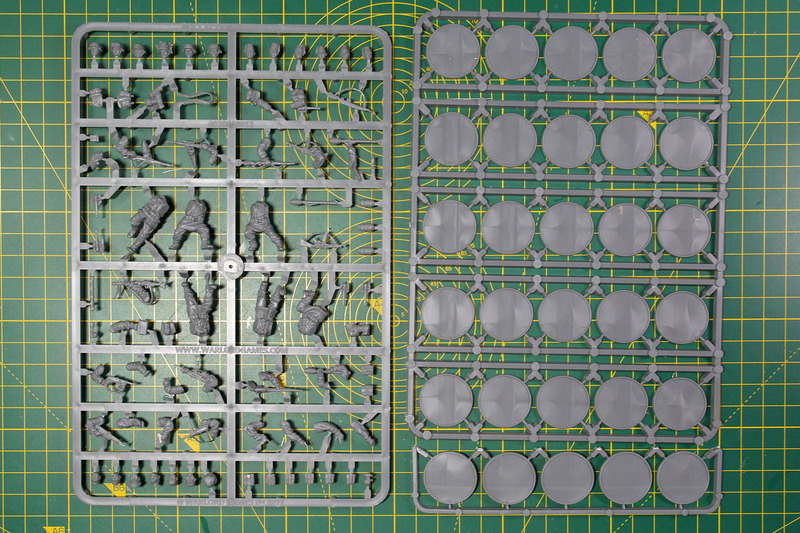 This box covers 30 plastic soldiers in 28mm scale, spread over 5 sprues, along with an instruction leaflet, that lists all the parts, matching 25mm round bases and a decal sheet. 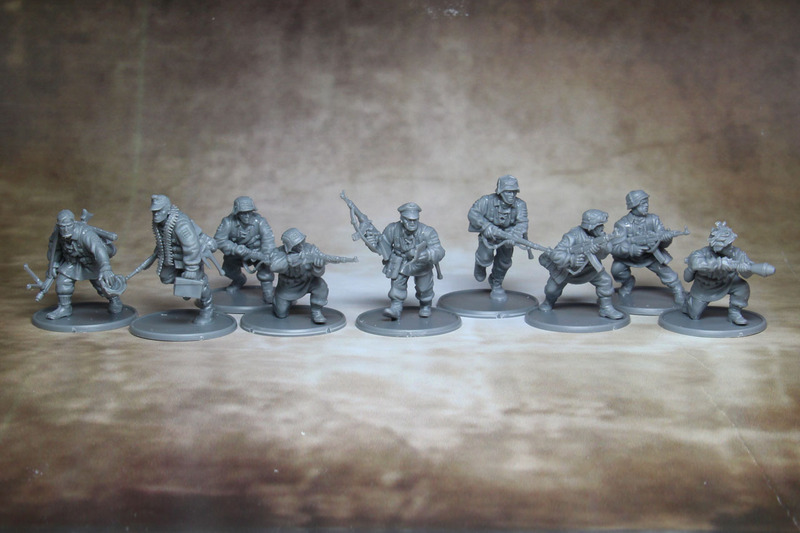 The price is set at the usual 26 GBP for the plastic infantry kits. 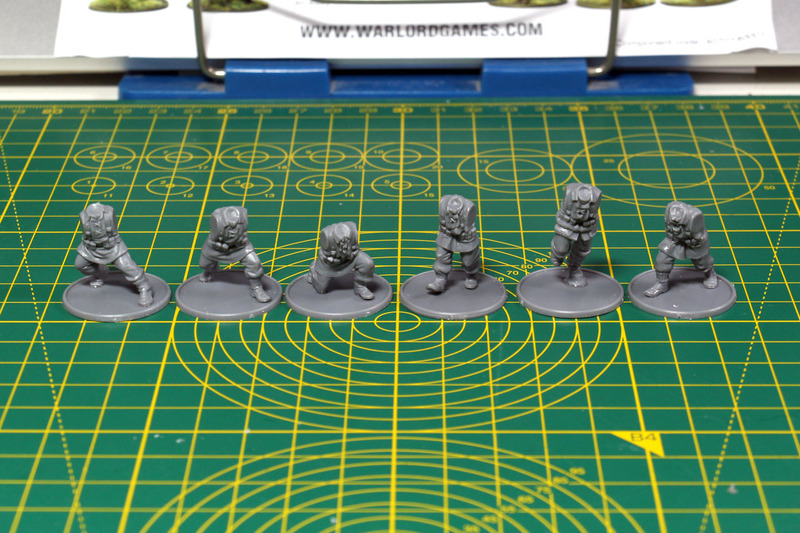 The casting is superb and the many different heads have a lot of expression on their faces. 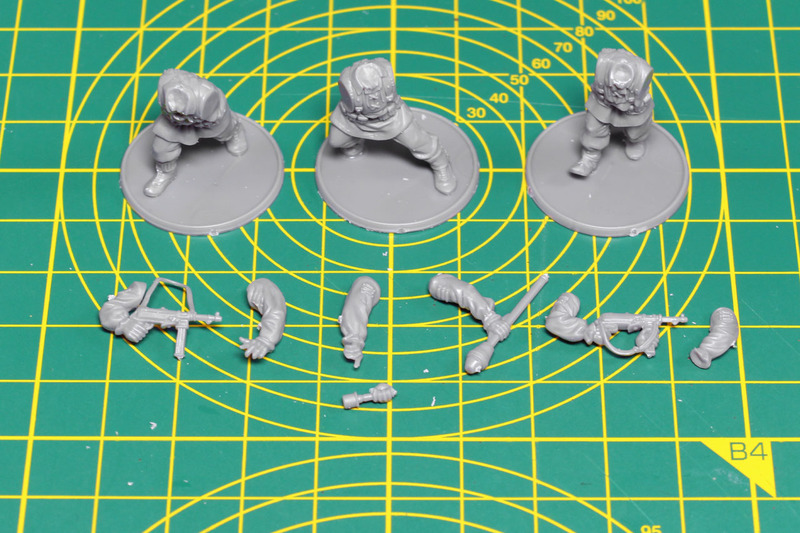 There is a total of 18 heads in this frame, 6 of which have the M43 fez, the remaining having (netted) helmets, side or field caps, officer cap or bare headed with an individual helmet. Lots of assault weapons as well, to show the generously armed troops. 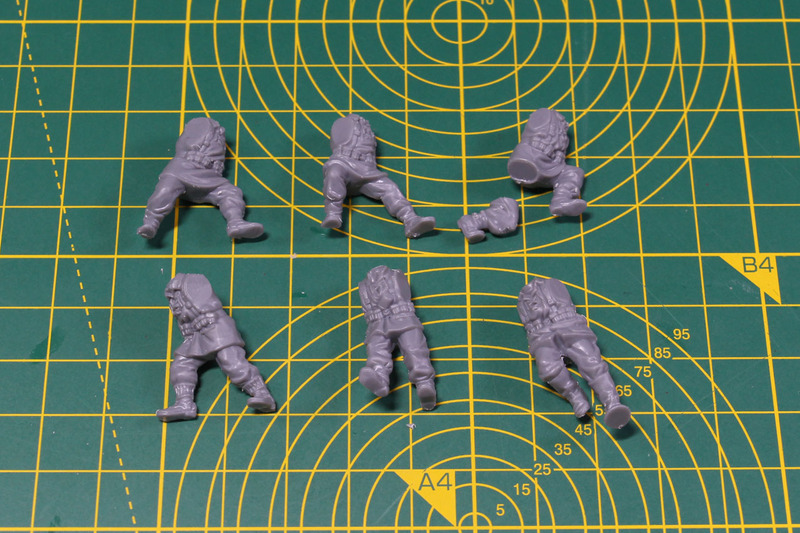 Let us start assembling a squad and additional soldiers by beginning with the torsos. There are 5 upright standing/walking/running poses and one kneeling pose to begin with. 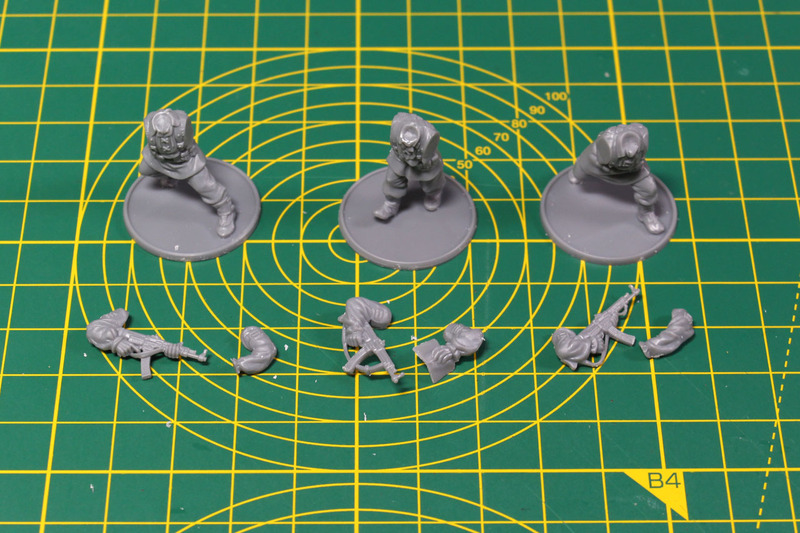 The kneeling pose has the right leg as a separate piece, so you can modify the stance by a bit. 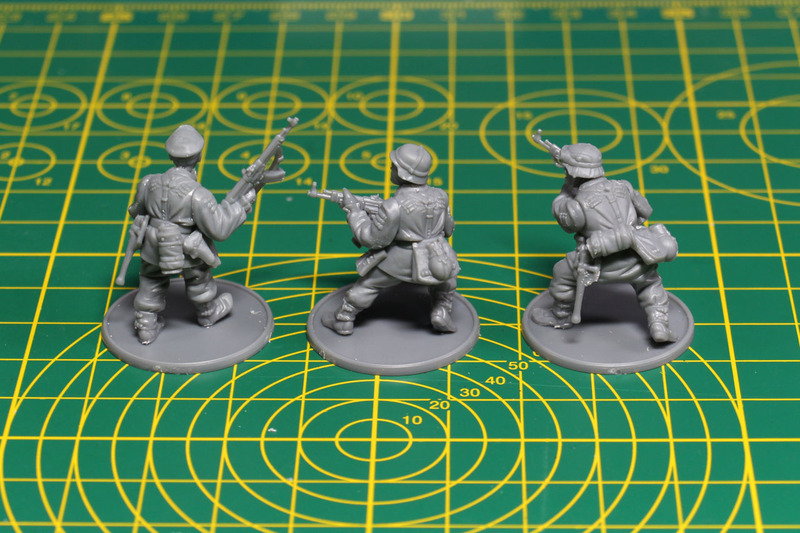 The NCO and two further soldiers will receive the StG 44 (Sturmgewehr / assault rifle), with the NCO carrying a map in his left hand. He could be armed with a broom handled Mauser as well. 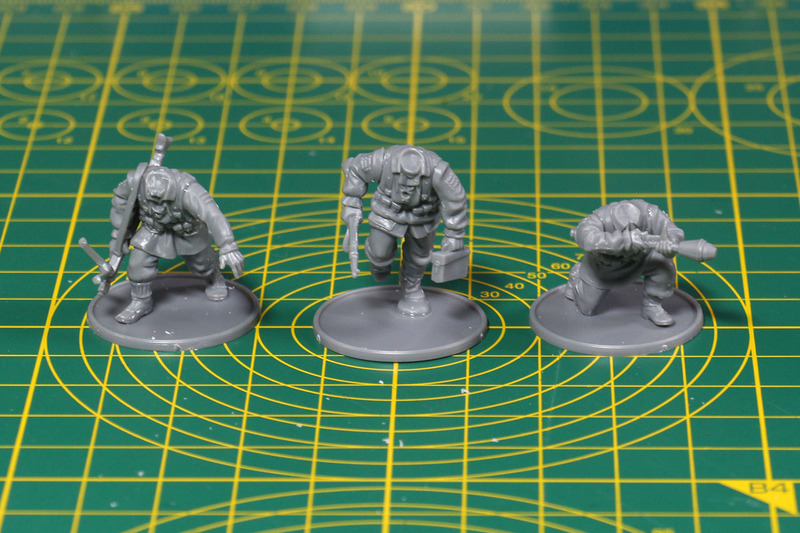 If you want to give the NCO for example field glasses, you would have to use bits from one of the other German plastic kits. 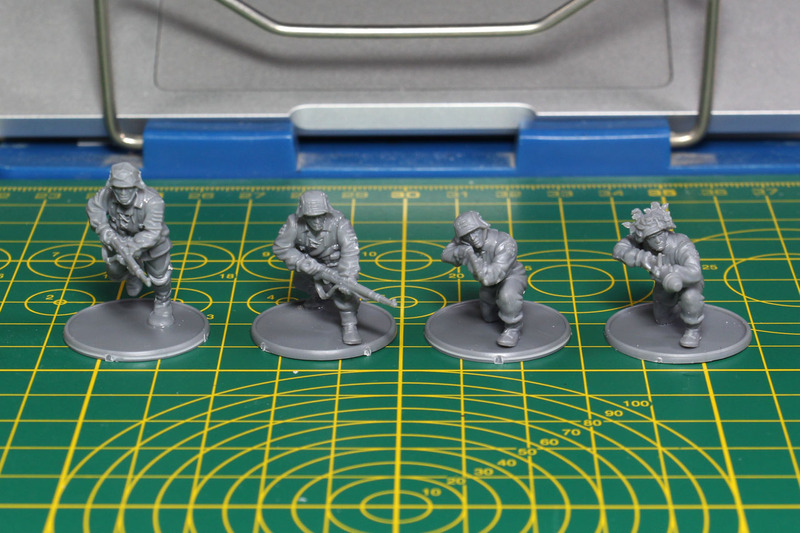 The "special weapon" models will have a MG43 as well as a loader with an ammo crate, and a further Waffen-SS soldier with a Panzerfaust. 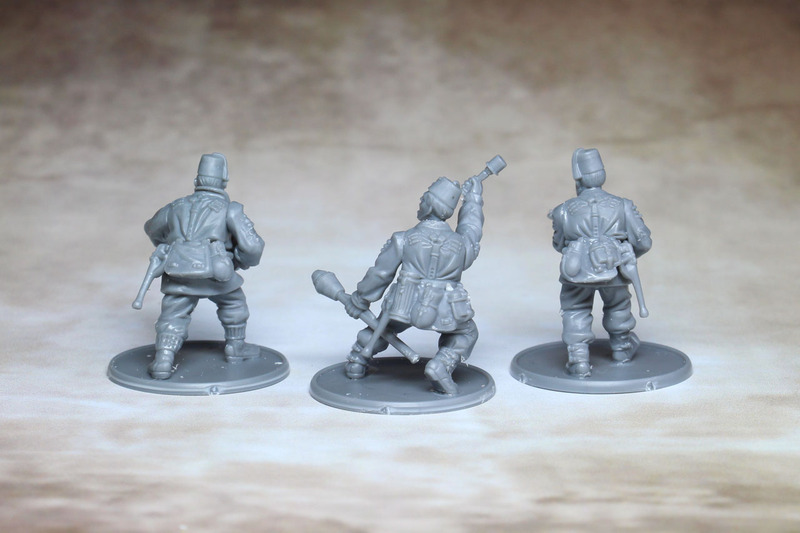 Three more soldiers with the iconic Kar98K rifle. 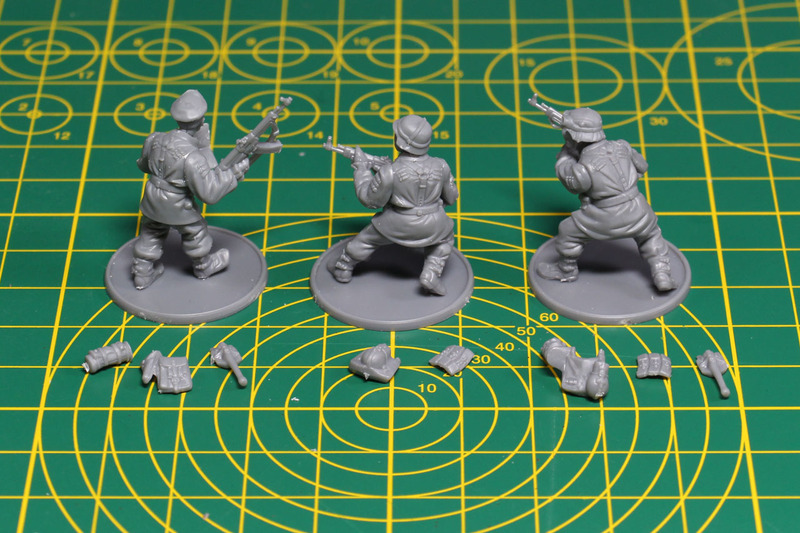 And a small squad of three, that will become the Handschar samples, with the MP40 and a hand grenade throwing and panzerfaust carrying pose. 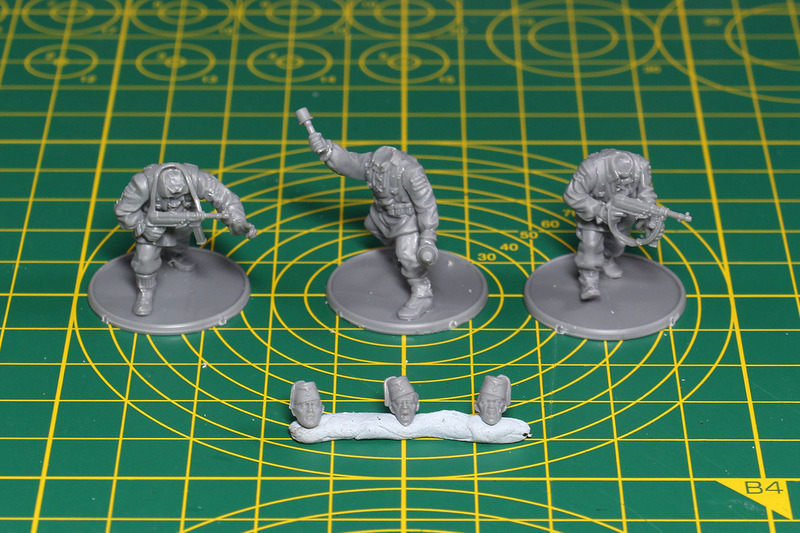 The hand grenade is a spare hand, for that to be put to use, you will have to cut off one of the other arms hands. 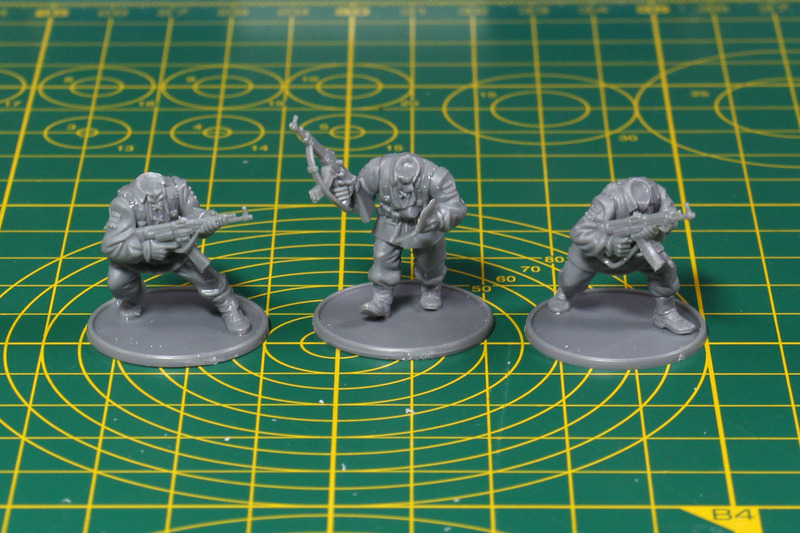 Now it is time to add the heads to the armed bodies. 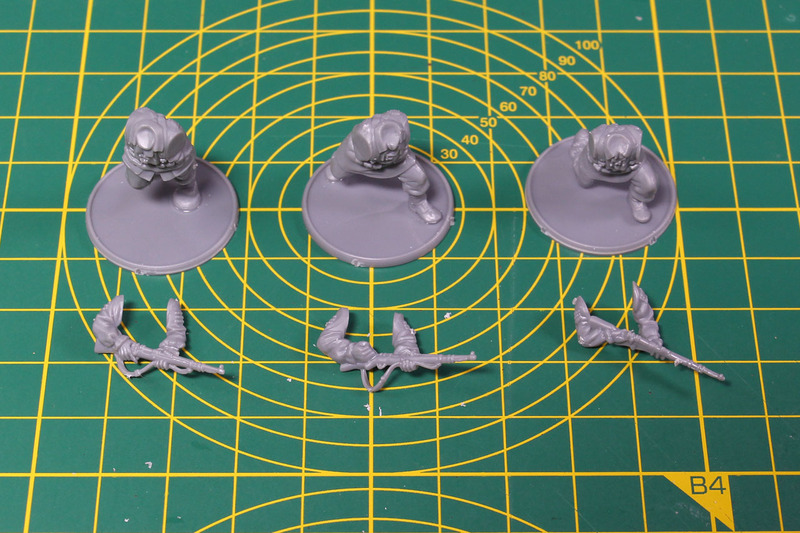 As mentioned above, there are 18 heads in total to choose from. 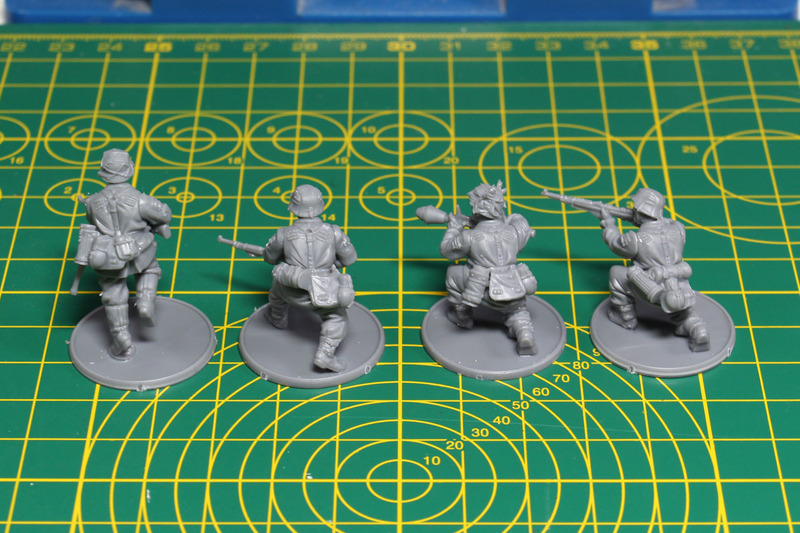 The regular squad will have regular helmets, with the MG team being bare headed / field caps and the NCO wearing a crushed cap. The handschar of course with the fez. 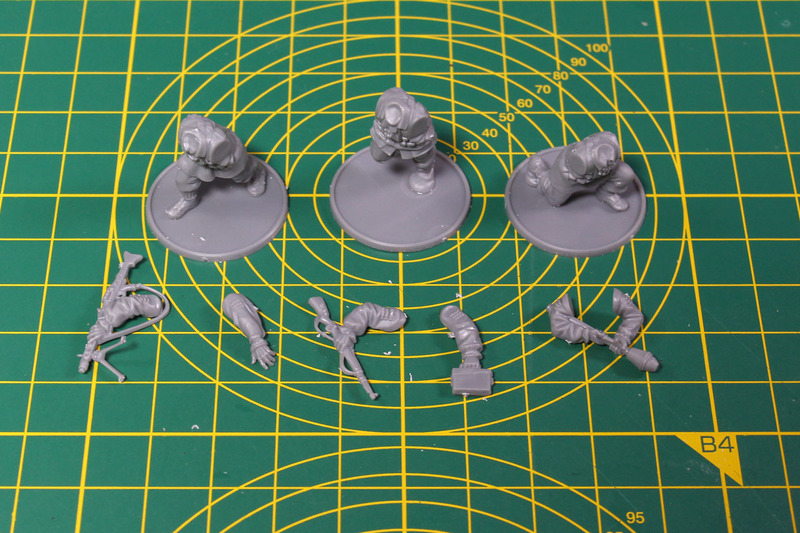 Now the only parts left are the backpacks and gear. 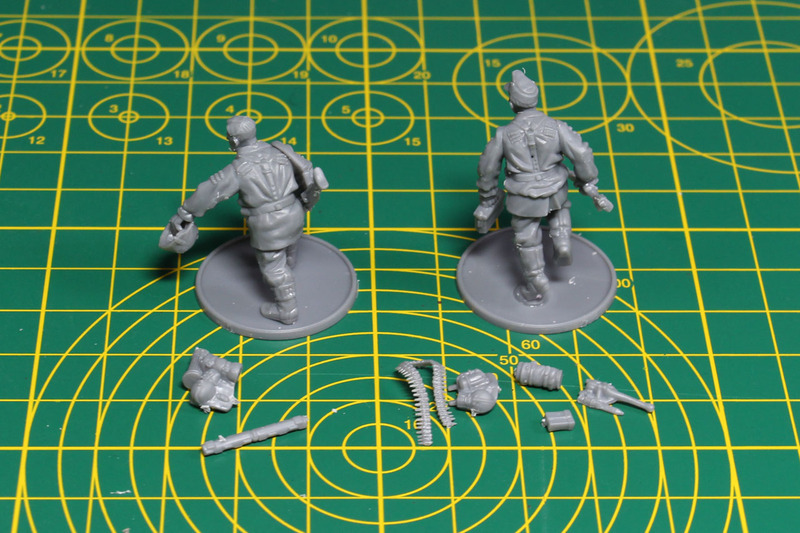 They have personal equipment, in case of the MG team they carry the ammunition belt, the replacement barrel and tool kit. 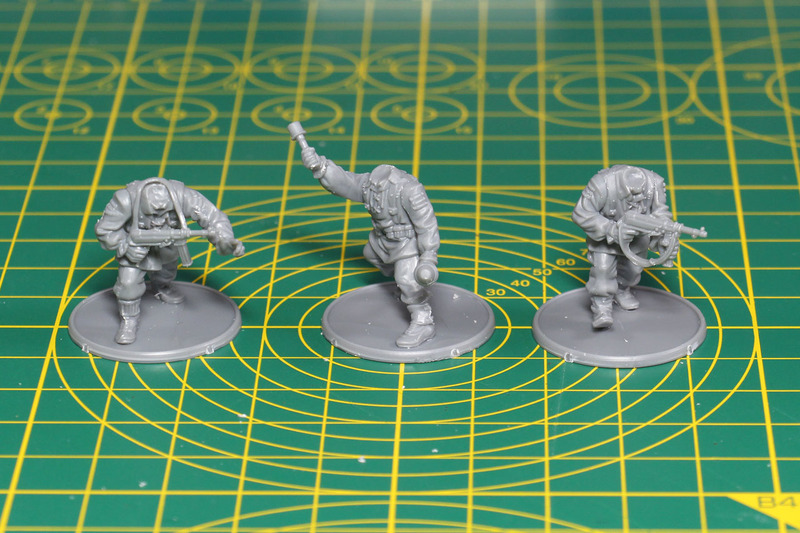 Along with the individual helmet in the left hand of the gunner. The handschar received the same treatment, regular personal equipment with the bread bag, bottle and entrenching tools. 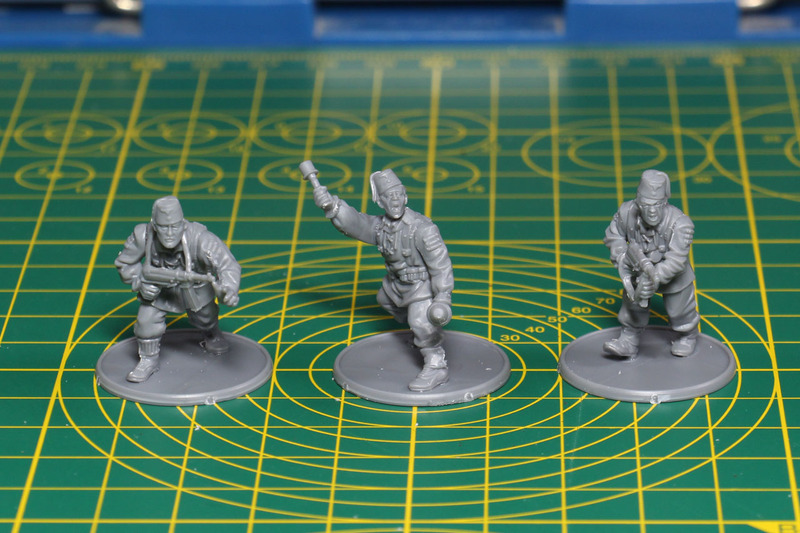 A squad of Waffen-SS soldiers including the MG team and a small group of three handschar soldiers. 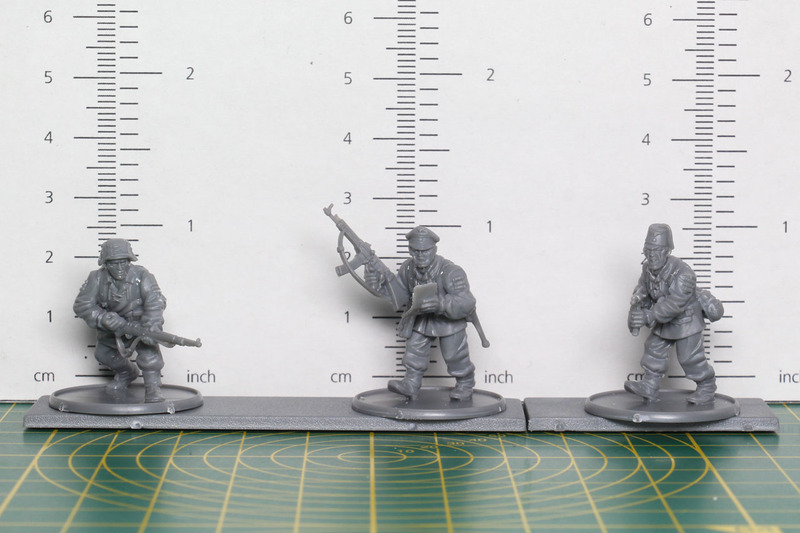 Scale comparison of the SS soldiers with different head gear, along with a comparison next to a regular Wehrmacht Grenadier and one of the metal Waffen-SS from the Charlemagne box. And the usual showcase pictures at the end of each review. 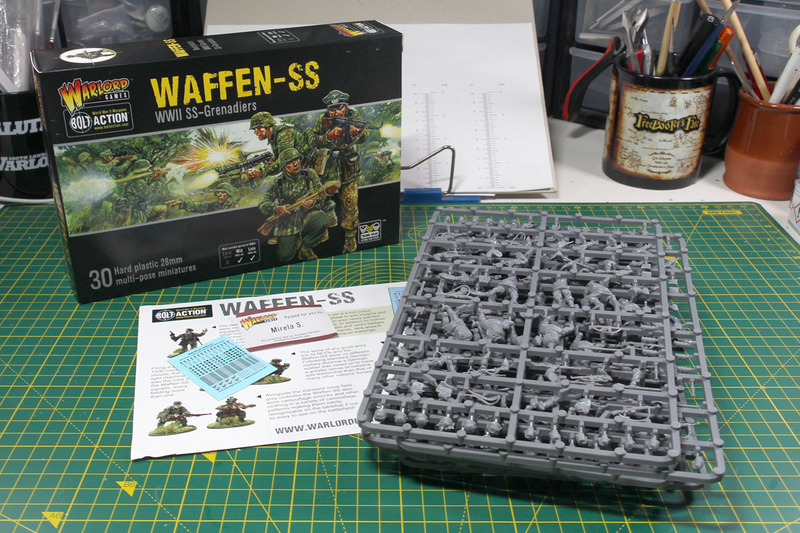 Depending on what you're looking for in an army, you can use these to field an entire Waffen-SS army, and as mentioned further above, with 38 divisions, there are quite a lot to choose from. 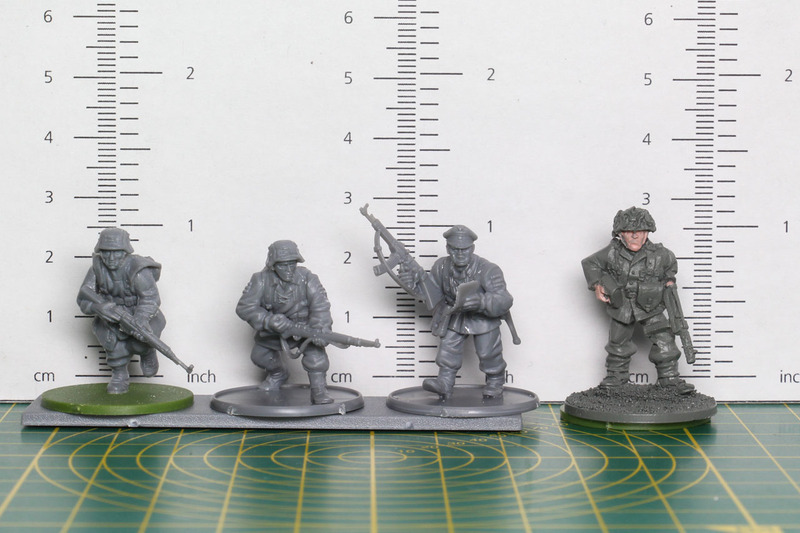 They fit on the Western and Eastern Front, from mid to late war and with the Handschar fez that special army became way cheaper (before that you had to buy the fez at 4 heads per 2,50 GBP or make your own). And there are quite a lot of volunteer divisions from all over Europe that would make an interesting themed army. 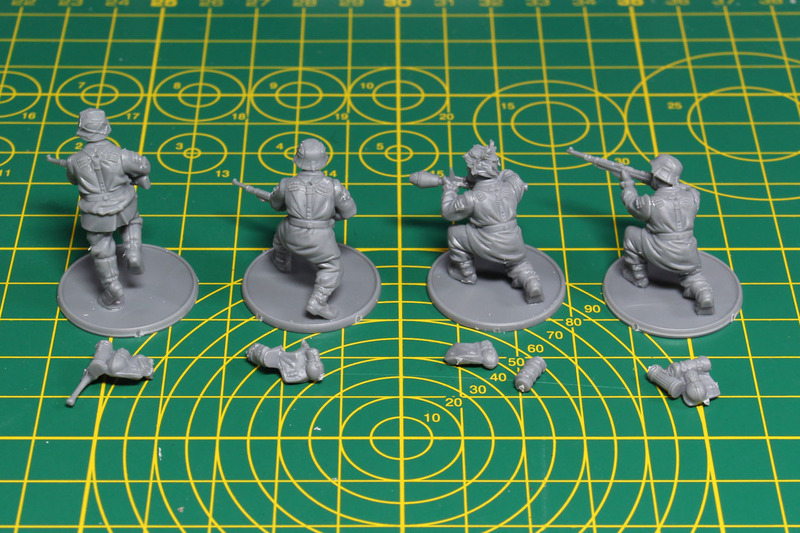 Warlord offers quite a lot of plastic kits for Bolt Action, especially for the Germans. 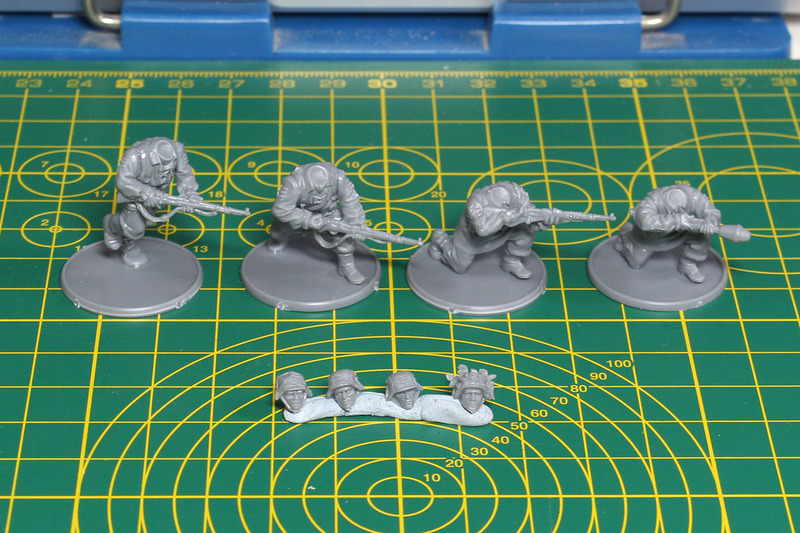 So if you add and mix some parts from the other kits, like the Grenadiers or winter troops, for more hands, weapon and gear options, you can build a richly diverse army entirely in plastic, for a more than reasonable price. 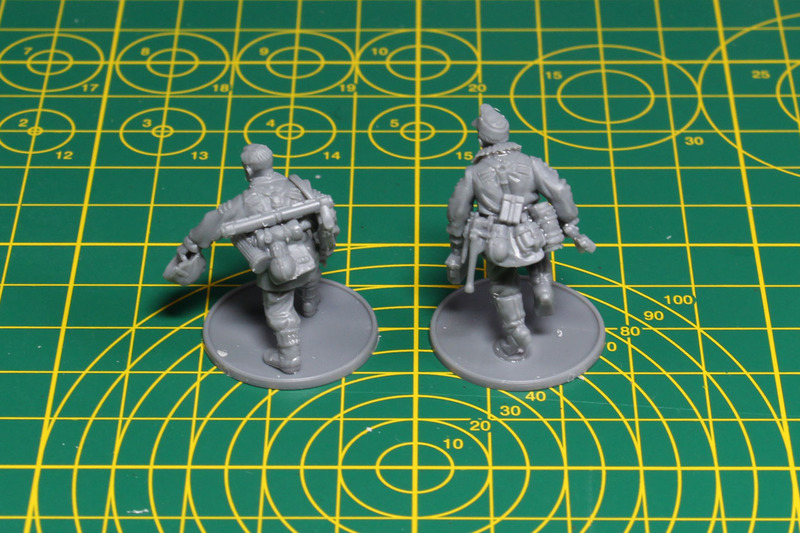 You could probably use some of the Grenadier bodies to represent soldiers not wearing the smock, as the Feldbluse was more or less the same of both soldiers beside the insignia. 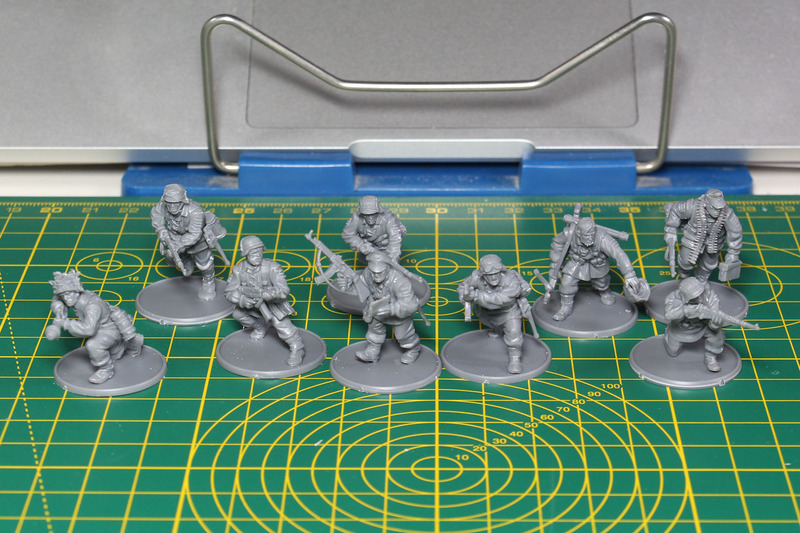 As usual these boxes give you a solid starting ground for a small Bolt Action army, as these are usually used as veteran infantry entries, you easily go into the territory of 500-750 points with just the 30 soldiers in this box. 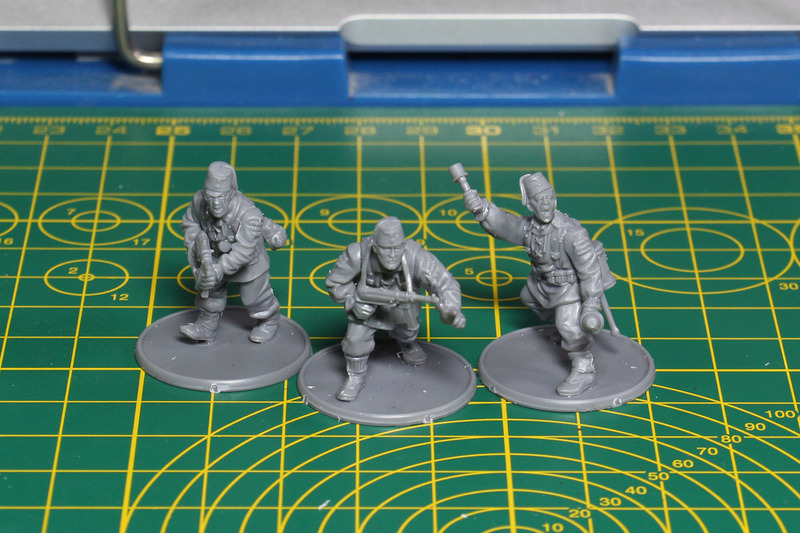 If you're just looking for a single unit of veteran infantry, depending if you're playing a winter or regular German army, I can strongly suggest looking at either the SS-Sturmbataillon Charlemagne or Waffen-SS in winter clothing. 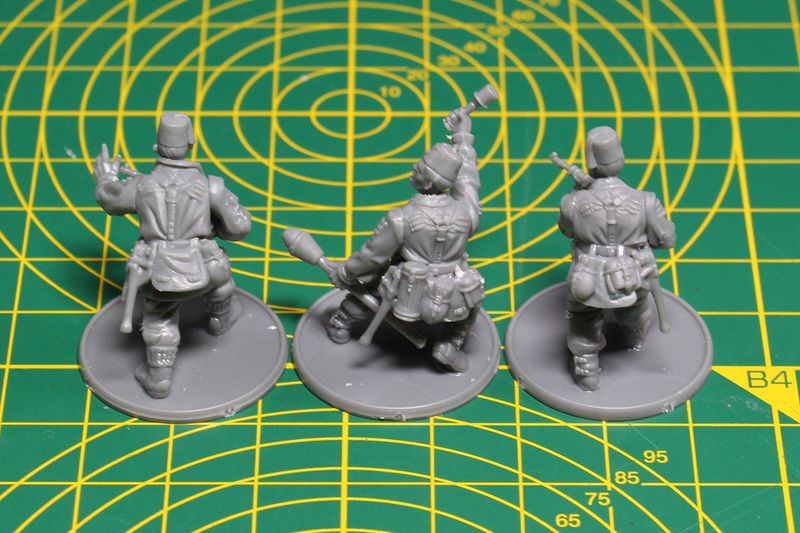 Both very characterful sets with 10 individual sculpts each. 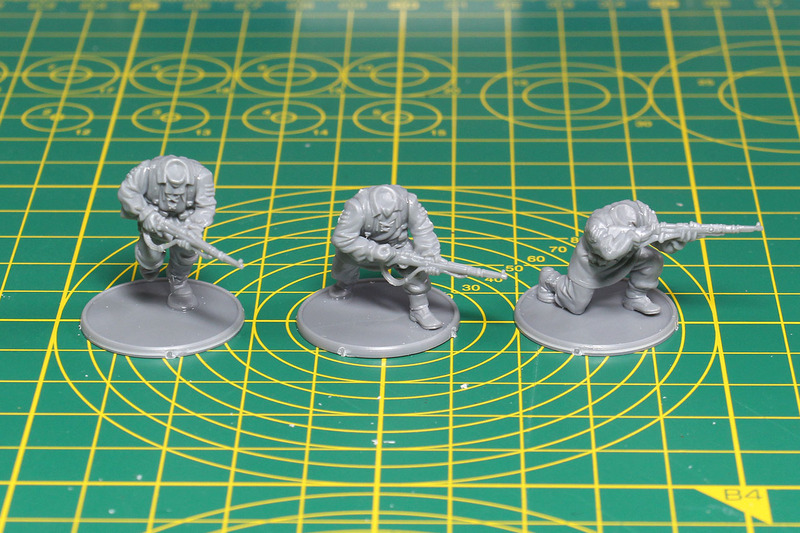 The casting quality on these is very good and the expression on the faces is amazing. Very characterful. 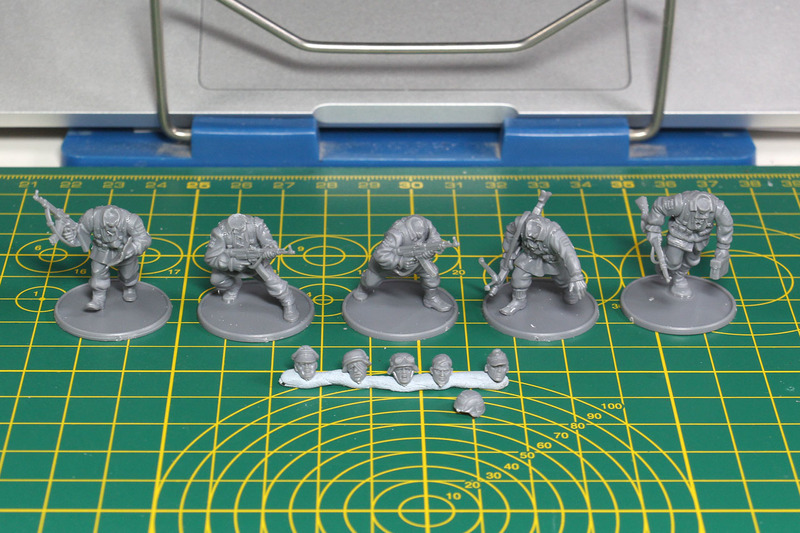 I recognized, while reading some of the Osprey books, that the sculpts of many faces of the Germans are heavily inspired by the artwork of Steven Andrew. So they represent the slightly cartoonish look of his drawings/paintings. But these look sterner, more serious. Very well done. 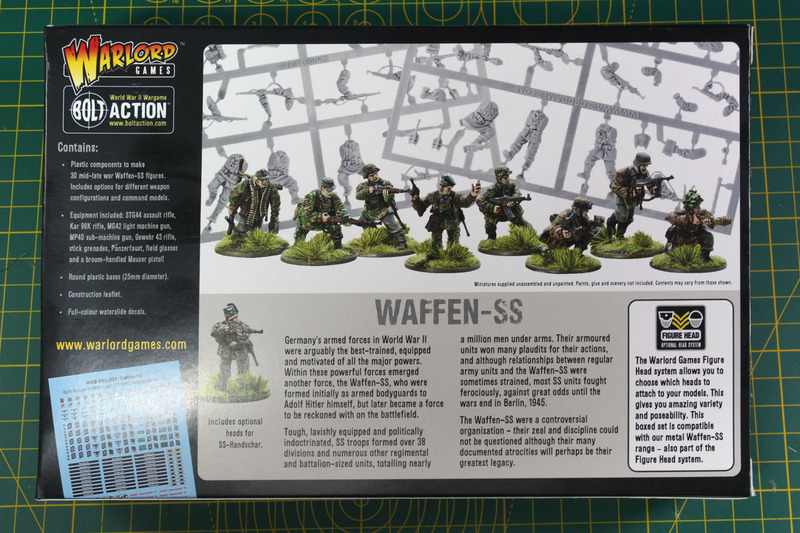 And again, just to be sure everybody read and understood it - This review is not meant to glorify any political ideas or (military) activities of the Waffen-SS and is purely meant to cover the quality of the plastic kit and its miniatures.